The purpose of the Neurologic Dry Needling for Pain Management and Sports Rehabilitation Course is to obtain knowledge and clinical skills necessary to diagnose and treat soft tissue pain and dysfunction using the Integrative Dry Needling (IDN) concept. This 27-hour applied-learning course combines interactive lectures and practical hands-on labs. Students participate in several practical sessions, which are intended to provide feedback to students regarding their comprehension of key concepts and techniques. These practical lab sessions enable students to critically self-evaluate if additional instruction or self- study is needed for clinical competency. Continuing Education: Approved for 2.7 CEU’s, 27 contact hours, and 32 CCU’s by the Federation of State Board of Physical Therapy as well as other state licensure boards independent of the FSBPT. Approved for 25 Category A CEU’s through the BOC. Neurologic Dry Needling for Pain Management and Sports Rehabilitation is the culmination of the work and clinical experience of Dr. Yun-tao Ma and Dr. Frank Gargano DPT. 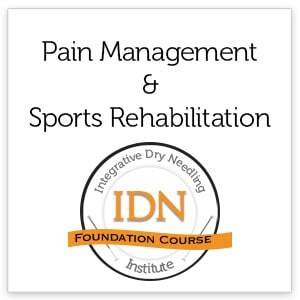 The Integrative Dry Needling (IDN) training program will develop the knowledge and clinical skills required to effectively diagnose and treat painful neuromuscular conditions. IDN teaches you to treat the body systemically; we do not divide the body into upper and lower halves requiring you to take 2 courses before you can treat the entire body. Our system is built on the foundation of Neurological Dry Needling that provides a logical and systematic process for addressing pain and dysfunction. As a result, course participants develop an adaptable clinical procedure allowing immediate integration of dry needling into clinical practice. Detailed, tried and tested needling safety techniques and contraindications for dry needling therapy to avoid human error in clinical practice. Adaptable dry needling system that easily adapts to clinical practice and to the specific needs of each patient. Systemic Homeostatic trigger point concept (physiological and biomechanical approach). Paraspinal trigger point concept (neurosegmental and dermatomal approach). Symptomatic trigger point concept (neuromyofascial pain in the head, neck, shoulder, upper limbs, thoracic, lumbar, hip and lower limbs). Independently identify each of the three types of trigger points (homeostatic, paravertebral and symptomatic) in a given case study. Integrate the physiological mechanisms of needling when developing a treatment plan for a given musculoskeletal condition. Discuss the prevention and management of adverse responses to dry needling based on OSHA requirements with 100% accuracy during case study. Independently apply dry needling treatment safely into musculoskeletal trigger points during lab sessions. Independently evaluate soft tissue dysfunctions relating to a given musculoskeletal condition and pain. Correctly defend the IDN system for treatment of musculoskeletal pain based on the unique neurology and physiology of neuro-trigger points. Independently discuss integrating the IDN system into the participant’s physical therapy practice in relation to current clinical, legislative and billing barriers. The 27 hour intensive practical classroom structured program addresses theory and key principles with extensive and supervised participant practice. Multiple PowerPoint presentations with video support will begin each new section. Instructor demonstration of the techniques allowing ample time for questions. Interactive lab session will follow where the participants practice and discuss each new technique and concept. After each interactive lab section is concluded there is an instructor summary and time for any additional questions. 8:00 – 9:30 Lecture 1: Introduction of concept, physiological mechanisms of dry needling, peripheral and central mechanisms, specific and non-specific mechanisms. 10:30 – 11:15 Safe needling handling and insertion techniques using 1/2″ – 1″ needle. Lab practice. 11:15 – 12:00 Lecture 2: Neuroanatomy of neuro-trigger points and development of Homeostatic neuro-trigger points. 1:00 – 2:30 Lab: Surface anatomy of neuro-trigger points in head, cervical, upper extremities. 2:30 – 3:30 Needling Lab-1”: Deep Radial (1), Superficial Radial (12), Lateral Antebrachial Cutaneous (9). 5:00 – 6:00 Lab: Surface anatomy of neuro-trigger points trunk and lower extremities. 8:00 – 10:30 Needling Lab 3″: needling of 5 points in the hip. Iliopsoas/pectineus/adductor/Inferior Gluteal (16), Superior Cluneal (14). Break on your own. 10:30 – 12:30 Needling Lab 2″: (2:2 Concept)- Lumbar to include Posterior cutaneous of L2 & L5, T7, Suprascapular (8) (infraspinatus) Subscapularis, Lateral Pectoral (17) with Pectoralis-horizontal needling. 1:30 – 3:00 Needling Lab-1”: (1:1 Concept)- Dorsal Scapular (13), Posterior Cutaneous of T6 (21), Abdominals. – Electrical nerve stimulation (ENS) demonstration and lab. – Special needling techniques: Twitching/Pistoning, Needle Rotation, Tenting. 10:30 – 12:30 Cervical Needling lecture and lab- Sternocleidomastoid, Greater Occipital (7), Cervical Paravertebrals, Suboccipitals. 1:00 – 2:00 Administrative Discussion: Consent to treat, political & legislative issues effecting practice, marketing, and final details of the administrating the practice of dry needling in your clinic. 2:00 – 2:45 Written test, group case studies. 2:45 – End Practical examinations. Airport : Cincinnati / Northern Kentucky Airport (CVG): 44 miles away from the course. Dayton Airport (DAY): 46 miles away from the course. Miscellaneous : Parking is available on site. There is a food court in the hospital and restaurants nearby. Excellent course for learning the technical skills of dry needling, as well as comprehensive review of the functional neurology. I would highly recommend this course. This course was excellent. I feel ready to perform dry needling right away. Best course I have been to in years. The advanced IDN course has taken my understating of dry needling and the nervous system to the next level. Just like I don't know how I practiced PT without dry needling, I don't know how I dry needled with out the knowledge I attained in the advanced course. As a practitioner for 32 years, I found the course and its presentation to be one of the most valuable trainings I have ever taken. Important - Please complete the following information fields for each course attendee. All fields are required. The fields currently do NOT validate your input, so be sure to include the correct spelling for attendee names, enter email addresses accurately, including the '@' symbol and 'dot' suffix (.com, .net .org etc), select the correct profession and enter the professional license number. We use the practitioner's profession and license number for verification and eligibility purposes.